· Participants will launch their lesson with a partner and practice presenting a Nearpod presentation. · Participants will look at the data collected at the end of the Nearpod presentation to see the reports available. · Participants will be given time to search library and add 3 lessons that they could use in the upcoming 9 weeks. · Get logged into a computer in the first two rows and sit next to a partner. · At the top of the website, find the Enter Code field and enter the code shared on the projector screen. · You will experience a Nearpod presentation first hand, with the ability to see both the student screen (yours) and the teacher screen (mine). 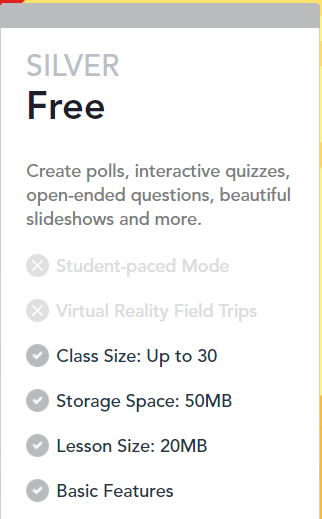 · You will now sign up for a free Nearpod account. If you have an existing account, go ahead and log in. · Check out the five colored tabs and their purposes: My Library, Explore, Join, Create, Reports. · Click on the “My Library” tab from your computer. § Live Session, which is the only option with the free account. This is how to launch your lesson. § Student Paced is a paid feature but would allow students to do Nearpod lessons independently or at home. · Now go to “Explore” at the top left of the page and find at least 3 lessons that you could use in your classroom in the upcoming weeks. o Be sure to click the Filters button to see how you can narrow your search to the most relevant results. o Click “Add to My Library” to save a copy of the lessons you like! · Each teacher will share at least one lesson you like with the group. · Click on the “Create” tab. Notice that you can upload existing PowerPoint or PDF files to Nearpod, so you don’t have to start from scratch! o Click Add a Slide and explore the different types of content and activities you can embed into your self-made presentations. · Partner up and practice launching one of the lessons that you added to your library with your partner, and briefly run through that lesson as a teacher while your partner pretends to be the student using the PIN to join. · Look over your own data and practice emailing it to your partner using the email feature. See how data can be shared with multiple stake holders. o How do you think you can best use Nearpod in your classroom? o What is one roadblock that might keep you from using Nearpod? · Please set up an appointment with me, if you would like for me to team teach a class with you the first time you use Nearpod with students, or if you would like for me to come help you create your own Nearpod presentation from scratch!